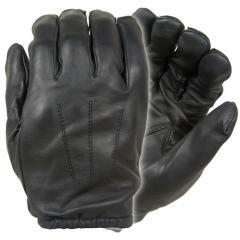 Protect hands and maximize productivity with the DFK300 Frisker K Leather Kevlar® Cut-Resistant Gloves from Damascus. Featuring an ultra-tough, ruggedized construction the gloves offer the dependable protection needed for even the toughest jobs. Perfect for working with metal, using heavy machinery or any other job where sharp surfaces are present, the gloves utilize a 100% Kevlar® lining to eliminate the threat of lacerations and deep cuts. The exteriors of the gloves are fabricated from premium cowhide to offer water-resistant use with superior gripping strength. Because comfort is a priority, the DFK300s have been factory-treated to preserve lifetime flexibility and breathability. The wrist cuff is kept short to prevent loose ends that could get caught on machines or other equipment. Great product. Only had to buy another pair because I lost them. Had the last pair 3 years and they still looked new.